This is the first in what will be an ongoing series of posts on the Texas economy from the standpoint of its metropolitan areas. Metropolitan areas are defined by the Office of Management and Budget, a part of the White House. Counties with interconnected commuting patterns are combined into a single metropolitan statistical area (MSA) or, metro area, for short. Each metro area is a common labor market. Companies in that metro area will generally be drawing their workers from the included counties. Despite its wide open spaces and Hollywood reputation, Texas is more urbanized than the U.S. as a whole. 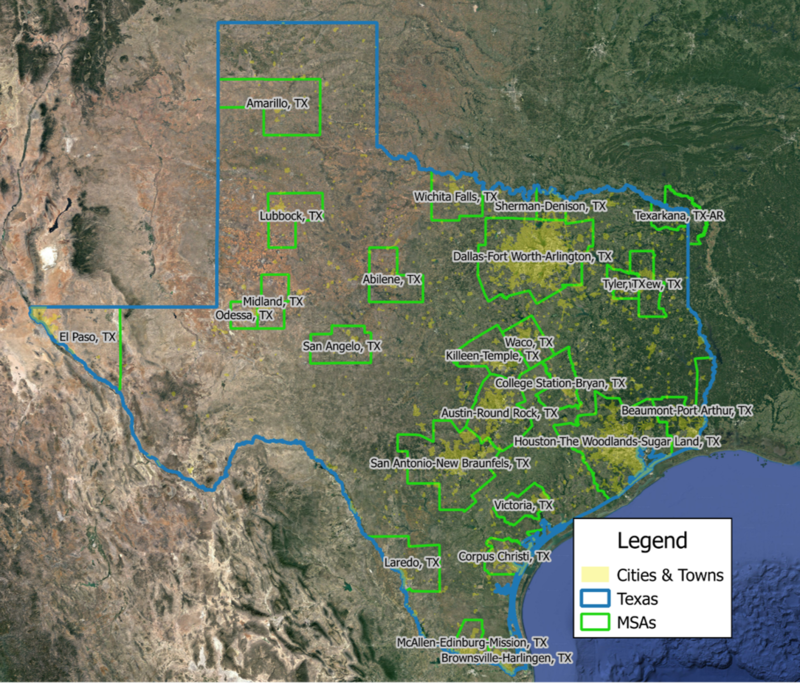 Texas urban areas include 85 percent of the state’s population compared with an 81 percent urban share for the nation. Texas’ 25 metro areas include 82 of our 254 counties. The map below shows the metro areas in green outline. Most of the metro counties are in the eastern half of the state. The map also shows the land area of Texas’ 1,700 cities and towns in yellow. Since metros are defined by county, many of the smaller MSAs include only one or a few small cities at the center of a mostly unincorporated metro area. Only the largest metros like Houston and Dallas=Fort Worth are mostly incorporated. This reminds us that population and jobs are even more concentrated than the metro boundaries imply. Economists and other researchers pay close attention to the health of metro areas. Most major government statistics are published at the metro area. Businesses and others base marketing and expansion decisions on the relative health of metro areas. Government planners and nonprofits need to understand metro area growth to better prepare public services like transportation and public safety. Texas’ total economy is over $1.6 trillion. That is slightly larger than the Canadian economy, and 25 percent larger than the Russian economy. Of that total, 93 percent comes from the state’s metropolitan areas. Clearly, it is essential to understand our metro areas if we want to understand the Texas economy as a whole. The table below lists all Texas metro areas and their GMP growth since the Great Recession in 2008. For comparison at the bottom, we see that the national economy grew 26 percent over the last eight years. Texas’ growth was slightly faster at 30 percent. Metro area performance varies. Only 40 percent, or ten of the 25, of the metro areas grew faster than the state overall. These tended to be the largest metro areas. The state’s smaller metros have not seen as much growth. This uneven pattern is identical to what economists have seen nationwide since the recession. Some communities are prospering, some are continuing to decline, and many are simply marking time. In future posts we will look closer at our metro areas by digging into the details of different industries and what is happening to jobs, households, and income within and across the state’s metro areas. The slowly unfolding tragedy in southeast Texas is a personal, emotional experience for millions of people. Eventually, however, Hurricane Harvey and its aftermath will also be counted in terms of the material and economic losses for households, businesses and governments. Beyond the immediate effect, there will be long-term fiscal consequences for many.How big might the impact be on local community economies and the local governments that serve them? There are problems with trying to measure the economic impact of a natural disaster this early, as it is still happening. First, historically, the early estimates of damage and economic impact in natural disasters tend to be higher than the final tally. Several factors contribute to this. Early estimates are made without the benefit of comprehensive data. Many economic statistics are only calculated monthly, quarterly or even less frequently. Structure damage is often over estimated. A building may appear to be a total loss, but often turns out to be salvageable with some repairs. There are also political motives, where local and state officials feel the need to present the worst possible case to maximize federal relief funding. Emotional trauma and media hype can also contribute to worst-case estimates. It is not easy to maintain objectivity in the face of life and death circumstances and continuous media exposure of surreal disaster footage. We are already seeing preliminary estimates for Harvey in the tens of billions of dollars. Chuck Watson with Enki Holdings threw out a $30 billion number. Kevin Simmons at Austin College speculated that it could exceed Katrina’s economic tally – over $100 billion. Since the storm isn’t over, and flooding will continue, these may prove to be accurate. As the storm moves east into Louisiana, the damages will increase. How can we begin to consider what the total might be. When work for state and local governments, it was helpful to point out to elected officials what the daily scale of economic activity in the community was. A day’s worth of economic output for a city or state is a good metric to compare against major economic events, good or bad. There are five Texas metropolitan areas in the impact zone of Harvey. These include: Beaumont – Port Arthur, Bryan-College Station, Corpus Christi, Houston-The Woodlands-Sugar Land and Victoria. These five metropolitan areas are home to almost 8 million people (2016 estimates.) Their economic output, according to the latest data from 2015, is about $565 billion. They represent a bigger economy than Argentina, or twice the size of Hong Kong. A simple average daily economic output for those metro areas comes to $1.5 billion. This is ongoing business based on the productive activity of people in the region, using their training and talents and the physical assets that make it possible. These assets include tools, buildings and infrastructure. If everything comes to a complete standstill, then there is a maximum loss of $1.5 billion each day. It is impossible to tell from news reports exactly how much business interruption there has been. The Houston Chronicle has started reporting on restaurants and grocery stores that were reopening as of Tuesday. The daily lost economic output will not be the greatest blow to the economy. The more important financial damages will be in losses of buildings, infrastructure, equipment and inventories. A third major impact is from loss of human life. Mercifully, there seems to be relatively few deaths so far. Each of these is a personal tragedy. Beyond that tragedy, each death also means the loss of that person’s talents and productivity forever. This will impact the prospects of the families and businesses involved. It can be helpful to consider an analogy in thinking about the impact of Harvey. The 2016 Louisiana floods centered on Baton Rouge are a smaller scale event but were similar to what we are seeing today. In that unnamed storm, areas in Louisiana saw over twenty 20 inches of rain in a few days. That storm dumped three times the amount of water on Louisiana as did Hurricane Katrina. In 2016, a LSU study for the State of Louisiana estimated that at the peak, about 20 percent of Louisiana businesses were disrupted, or about 19,000. Almost 5,000 experienced actual flooding. Two weeks after the peak of that flood, there were still an estimated 5,000 experiencing disruptions. The Louisiana flooding hit an economy only about 1/5th as big as our affected Texas metros. Still, the LSU study proposed a $8.7 total economic impact, excluding lost public infrastructure. The study, done shortly after the floods, does not appear to have been revised. It was still being cited in federal disaster relief reports as late as earlier this month. A storm delivering twice the flooding on an economy five times larger could equally rival the impact of Hurricane Katrina. This is not an estimate, but this simple framework is a way of starting to sort through the many conflicting reports we will see in the coming days. The larger economic impact numbers include potential hits to local governments. There are short-term and long-term impacts. Cities, which already have strained finances must increase their public safety operations in and immediately following a disaster. Clean up and waste disposal during recovery adds additional costs. Long-term, local governments will need to rebuild streets, water systems, traffic signals and replace vehicles. There can also be serious losses to public buildings like libraries, fire stations and schools. A lane mile of road can cost $1.5 million to build. Traffic signals for a four-way intersection can run $300,000. These costs quickly add up. The City of Houston alone, has a massive inventory of physical assets. According to the city’s latest comprehensive annual financial report, the city owned $8.6 billion in buildings, improvements and equipment, and listed $16.7 billion in infrastructure assets. These figures are reported before depreciation. Some damaged or lost assets will be replaced from the city’s annual capital budget. Given the magnitude of the expected losses, much of this will need to be paid for from new debt. That will put pressure on day to day operations for years. Harvey also comes at a crucial time on the local fiscal calendar. Most cities in the state have a fiscal year that begins October 1. Houston is one of the few that do not, having a July start to their budget year. Elsewhere, city managers and budget directors have already completed their proposed budgets and identified the property tax rates they will need to meet those budget responsibilities. City Councils are poised to adopt those budgets in coming weeks. Hundreds of cities, school districts and counties will be dealing with recovery from Harvey, and scrambling to adjust those budgets. This can also cause misallocations and waste. Quick, chaotic budgeting is seldom wise budgeting. We will follow developments as this historic disaster unfolds. Though it is almost impossible to maintain objectivity in the face of suffering on this scale, we hope to continue bringing our fiscal sustainability perspective to the situation in Texas and Louisiana in the coming week and months. Our prayers and thoughts go to those living with Harvey’s effects. For official information and ways to help those in need, see the State of Texas emergency website here. This week we review changes in property market values and tax base for 25 cities in Dallas County since 2007. This builds on the analysis throughout the last month focusing on the property tax and its importance to local cities. Last week we looked at the structure of the tax base in our 25 cities on the eve of the Great Recession in 2007. Since then, there has been substantial change in the local economy. Our 25 cities saw their combined tax bases grow by 30 percent between 2007 and 2016. The average change for these cities was 45 percent and the median change was 27 percent. The largest and smallest changes were 308 percent and 3 percent, respectively. Because of some changes in reporting over the period, it is difficult to calculate an accurate change in tax base by commercial and residential categories. Instead, we can present the changes in market value for these categories. The combined residential market values for the 25 cities grew 29 percent from 2007 to 2016. The average of the individual city changes was 24 percent and the median of the city changes was 27 percent. There was considerable variation across the cities, with the largest increase being 143 percent and a decline of 8 percent on the other end of the scale. The changes for the 25 cities in shown in Figure 1. Figure 1. Change in Residential Market Value 2007 to 2016. On the commercial side, the total change for all 25 cities combined was 43 percent. The average of the city changes was 76 percent and the median was 43 percent. There was a very wide range of growth rates across the cities. The largest increase was 533 percent and the smallest increase was 16 percent. The change in commercial market value is shown in Figure 2. Figure 2. Change in Commercial Property Market Value 2007 to 2016. Between 2007 and 2016, most cities saw the share of total market value in commercial property increase. That is, commercial property grew in importance compared to residential property. The average change for the 25 cities was a 5-percentage point increase in the share held by commercial property. The median increase was 3-percentage points. The largest shift was a 26-percentage point increase in commercial property’s share of total market value. The largest decrease in share of commercial property was 1 percentage point. The change in the share of property values in commercial property are shown in Figure 3. Figure 3. Change in Commercial Property’s Share of Total Market Value 2007 to 2016. We continue our series on the property tax in 25 cities that are primarily in Dallas County. This week, we look at the structure of our cities’ tax bases. That is, how it is distributed in terms of residential and commercial tax base and the extent to which cities have exempted their tax bases for various policy reasons. We are presenting the data from before the start of the Great Recession, 2007. The structure of the tax base can have important impacts on the behavior of local governments. Next week we will look at how these cities’ tax bases changed since 2007 by adding in the data for 2016. Taxable values are what counts for delivering local government revenue. Taxable value can differ from market value because of exemptions that local governments offer. These include homestead exemptions and tax freezes on single family residences and various economic development abatements on commercial property, among others. Because each city council sets these exemptions, we can expect the taxable share of property to differ from city to city. This is the case. Figure 1 summarizes the situation for the combined tax base of all 25 cities. When looked at individually, our cities have total taxable values, as a percent of total market value, that range from a low of 68 percent to a high of 93 percent. The average of the 25 cities is 85 percent and the median is a little higher at 87 percent. Figure 2 compares the taxable shares of market value for the 25 cities. The property tax rolls are summarized into three broad categories of property: real commercial property and real residential property include land and improvements (buildings.) The third category is business personal property, which is other income-generating property. Just as cities present different overall taxable shares, the fraction of property that is considered taxable across property types differs even more. For commercial real property, there is a very wide range. The low and high percentage that is taxable runs from 37 percent to 93 percent. The average taxable amount for commercial real property is 74 percent and the median is 79 percent. For business personal property, the range is from a low of 53 percent to a high of 100 percent. The average and median percentages are 90 and 97 percent, respectively. Finally, for residential real property, the share that is taxable varies from a low of 72 percent to a high of 98 percent. The average rate for all cities is 88 and the median is 91. Our cities tax bases show different concentrations of commercial and residential. This is because business and residential activity is not uniformly distributed across the region. There are major business centers in the county, such as downtown Dallas, Richardson and Irving. Cities without such a business center or that lack significant highway frontage will have relatively small business tax bases. This means that the residential segment of the market will have to shoulder the burden of supporting property taxes. The share of commercial real property ranges from 5 percent to 68 percent. The average is quite low at 28 percent. The median share is 26 percent. Business personal property is roughly, but not perfectly, distributed where the commercial real property is located – with an 82 percent correlation between the two. To get a truer comparison of residential and commercial tax burdens should combine commercial real and business personal property. When we do that, we see that the total share of the tax base in these combined sectors runs from 7 percent to 86 percent, quite a wide range. The average share for these two combined is 41 percent, with a median of 39 percent. So, in general, our cities have more of their tax base in residential property than in commercial property. Actually, only eight of the 25 cities have a majority of their property tax base in commercial property. Necessarily, the residential tax base makes up what is left. The range runs from a low of 14 percent to a high of 93 percent. The average for all the cities is 59 percent. The median is 61 percent. Figure 3 shows the share of taxable value that is commercial + business personal property and residential real. This is the tax base structure our 25 cities had on the eve of the Great Recession. This is what their management and councils had to work with as local property markets began several years of declines. In many cases, the local choices were influenced by these tax base differences. Next week we will see how these cities’ tax bases had changed by 2016 and several years of recovery. Communities everywhere are looking for ways to strengthen their economic competitiveness and to do so in less wasteful and more sustainable ways. Placemaking and branding are sometimes considered too ephemeral to be a development strategy, yet, they are very cost effective. Given the importance of retaining and attracting talent, placemaking can be the centerpiece that helps coordinate and give other development tools coherence. Local leaders should think about placemaking as a process of facilitating the collective private initiatives of businesses and residents in each neighborhood. This may seem counter to the common notion that placemaking is a way of making your community more attractive to those fickle and footloose creatives. We believe that the sustainable success of every community will come from those who are already there and those who may want to join them in raising families and building local businesses. So the primary goal of placemaking is to do things that make the community better for those already there. Placemaking and branding isn’t about turning a community into something it is not. It is about helping communities make the most of what they have, nurturing a shared vision that attracts local private interests to make their unique contributions. The community will experiment and generate businesses to meet the needs of the local neighborhoods. Some will fail, but others will survive and over time the business community will be fine-tuned to the needs of local and visiting customers. Placemaking is important to making our cities and towns more sustainable because it increases the power of local businesses and residents to succeed in ways that reinforce local assets and nurture uniquely appropriate ventures to each community. These kinds of neighborhoods will have a much easier time satisfying their needs with locally grown businesses employing local residents. The private sector does most of the placemaking. Local government can still help coordinate, reform regulations and provide small scale incentives that help guide private efforts in ways that multiply the impact. We recommend a bottom-up approach where local leaders engage the community to encourage competitive experimentation. These experiments can take a variety of forms, but they share a few things in common. First, they are the idea of residents and businesses, not outside consultants. Second, they should be small scale. Placemaking only works at a fine-grained level. Generally, the place is somewhere that can be explored on foot. This reinforces people’s perception of the area as a place. It is hard to create a sense of place if you have to drive from venue to venue. Cities and larger districts can be supported by branding efforts. Branding can help communicate the assets of a place, but is secondary to place making. We always recommend that when working on a placemaking effort that the stakeholders actually walk it. They should also watch how others walk it. Once you have engaged your community, it is okay to give them some broad parameters or concepts if they have trouble identifying some immediate initiatives. Two options include improving local connectivity and events. Building connections helps local residents take advantage of existing assets. Most neighborhoods have separated land uses. In many cases, however, these land uses are nearby. Yet, they lack the physical infrastructure that would permit households and businesses to more easily access each other. There are often relatively low-cost ways to lower the barriers to connecting uses. This can increase value for residents and businesses. Ask what connections the community thinks would be most valuable. You can also observe pedestrian patterns to see where people are trying to overcome a failed public infrastructure. The presence of dirt paths along roadways or through abandoned parcels is a clear sign that pedestrians are trying to make connections. Painting crosswalks and other visual ques that let drivers know the route is used by pedestrians improves safety. Where low-cost interventions improve connectivity, and increase use, in the next round, the community may decide to reinforce these links with more permanent fixes like better signage, lighting and sidewalks. Placemaking can be facilitated by regular events. Events can help build social capital in a community. These need not be extravagant. Indeed, they should start small with little cost. Gather the stakeholders and ask what they would like to do. With a small budget, several experiments can be tried by different interests in the neighborhood. The successful ones can be singled out for additional support. In every case, however, these programs will be more sustainable if they grow organically. Planning a first time, major blow-out event is a good way to build excitement that is hard to maintain the following year. Financial sustainability is also hard to maintain when you start with a big budget in year one. Placemaking strategies are focused on helping a neighborhood identify its strengths and opportunities and make the most of its assets. Every neighborhood is unique and they will vary in their successes. Regardless of its potential, every neighborhood can become a sustainable, identifiable place. This gives its residents a sense of pride and makes a net contribution to the social, economic and fiscal sustainability of its home city. Today we look at the just-released metropolitan area gross domestic product (GDP) data. This data release from the U.S. Bureau of Economic Statistics brings the data up to 2015. We can use this data to compare the 382 metropolitan areas in the U.S. to the overall performance of metropolitan America. As a reminder, GDP is the total value of economic activity produced in an area. Though there is a delay in this data, it is an important economic indicator for local leaders. The analysis below uses real GDP, which has been adjusted for inflation so we can compare changes over time. From the BEA press release we see that GDP increased in 292 metropolitan areas in 2015 compared to the previous year. In other words, approximately 76 percent of MSAs saw growth in their total GDP. The sectors that contributed most to this growth were professional and business services; wholesale and retail trade; and finance, insurance, real estate. Growth in these three broad industry categories was widespread. Out of the 382 MSAs, these industries grew in 77 percent, 88 percent and 64 percent of MSAs, respectively. The headline numbers discussed above do not account for population growth. We like to look at per-capita changes in GDP to give a better idea of the actual health of a community. The economic output per person is a better indicator than overall MSA growth. This is because businesses that are achieving higher per-worker growth rates can afford to increase wages. Slow per-capita GDP growth means stagnant wage growth. To get a longer term perspective, we looked at compound annual growth rates for three time periods. We calculated these rates of change for the seven years before the great recession (2001 to 2008), the seven years after (2008 to 2015) and we looked at the change from 2014 to 2015. Using compound annual growth rates cancels out the year to year ups and downs. In the seven years before the Great Recession, the per capita GDP for all MSAs grew at a 1.1 percent rate annually. In the seven years after the Great Recession, that growth rate fell to 0.3 percent. Growth accelerated again in the last year to 1.6 percent (between 2014 and 2015.) This national growth rate is a benchmark we can compare all metro areas against. In per capita terms, there were fewer growing MSAs nationally than when looking at growth not adjusted for population. There were 274 MSAs that saw per-capita growth in the last year. We found that economic growth was more widespread across MSAs before the Great Recession that after it. In the period before the Great Recession, 188 MSAs grew faster than the national average. That amounts to 49 percent of all MSAs. In the seven years after, growth was more concentrated, with only 149 MSAs exceeding the national growth rate. Those MSAs accounted for 39 percent of all MSAs. This trend seems to be intensifying, with only 34 percent of MSAs growing faster than the U.S. in the last year. Looking at Texas, we see a different pattern. There are 25 MSAs in Texas. Before the Great Recession, 64 percent of them grew faster than U.S. After the recession, 76 percent, (19 of the 25) grew faster than the U.S. in per capita terms. This may reflect the boost given to many Texas MSAs from the shale oil boom. That boom was beginning to deflate by 2015 and it shows in Texas MSA growth rates. In the last year since the recession, only 10 MSAs in Texas were growing faster than the U.S. The following table lists all Texas MSAs with their per capita GDP growth rates. Source: Axianomics, LLC analysis of U.S. BEA data.